Special to the Journal/Gary Leininger Salem’s Josh Lehwald (right) finished fifth and East Palestine’s Daniel Bender (left) was sixth in the 100-meter dash as the F.E. Cope Invitational at Reilly Stadium on Friday. SALEM — The Salem boys and girls track teams always seem to do their best at Reilly Stadium. The Salem boys won for the fourth straight year, while the Salem girls also repeated at the 27th annual F.E. Cope Invitational on a rainy Friday. The Salem boys won four events and showed their team depth to pull away from the 14-team field with 108 points. Austintown Fitch was second with 101. Even with all the Quakers’ success, their most impressive effort came from senior Trey Double, who finished second in the 800-meter run. Howland senior Vincent Mauri was first in 1 minute, 57.79 seconds, followed by Double in 1:58.25 — both bettering the meet record of 1:58.70 set by Salem’s Ross Zornick in 1994. Double’s time in the best by a Columbiana County athlete in 12 years — since Salem’s Patrick Gorby won the 2007 Division II state title — and joins Salem’s Quinlan Rumsey as the only two to go under two minutes in that span. Mauri was the state runner-up in Division I 3200-meter run last year and finished fourth in the Division I state cross country meet last fall. Double, joined Jacob McLachlan, Cameron Christopher, Hunter Christopher on the winning 3200 relay team ( 8:37.15). 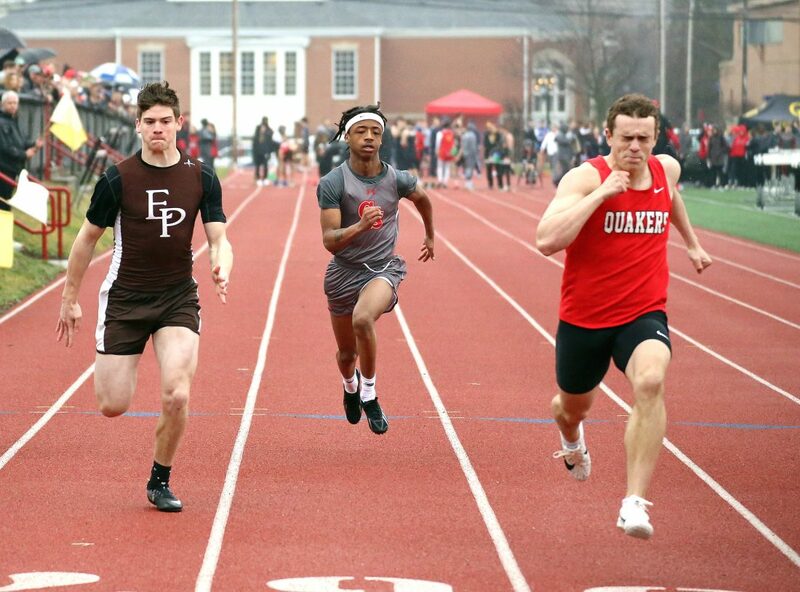 Other winners for the Quakers, were Hunter Christopher in the 1600 run (4:27.86), Zach Murray in the 110 hurdles (15.47 seconds); and Niko Walter, Andre Tonkinson, Zach Murray, Josh Lehwald in the 400 relay (45.13). The Crestview boys had three winners. Defending Division III state champion Dominic Perry won the shot put for the third straight year (55-0 1/2). Ethan Powell also won the 200 dash (22.61) and joined Dylan Huff, Brandon Yanssens and Jayce Meredith on the winning 800 relay team (1:32.45). East Palestine’s Stephen Darlington was first in the high jump (6-2). The Salem girls –led by four-time winner Haley Rozeski — ran away with the team title, winning eight events for 138 points. Austintown Fitch was second with 124 1/2. Haley Rozeski won the 800 run (2:22.97) and 3200 run (12:01.25) and joined Halle Cochran, Kelly Hutton and Carly Hall of the winning 1600 relay team (4:16.72) and Hutton, Lydia McKee and Paige Bailey on the winning 800 relay team (1:53.63). Hall also won the 1600 run (5:27.65) and joined Halle Cochran, Abie Cochran and Alexis Miller on the first-place 3200 relay team (10:45.28). Salem’s Caitlyn Marx and Abbie Antram swept the field events a second straight year. Marx won the discus for a third time (137-3) and Antram repeated in the shot put (36-6. The meet is held in honor of the late F.E. Cope, a longtime Salem athletic director and track official. TEAM STANDINGS: 1. Salem (108), 2. Austintown Fitch (101), 3. Massillon Perry (66 1/2), 4. Crestview (63), 5. Akron Coventry (53), 6. Youngstown Chaney (39), 7. Girard (32 1/2), 8. Howland (30), 9. Canton South and East Palestine (29), 11. Canfield (26), 12. Struthers (23), 13. Youngstown Mooney (16), 14. Leetonia (2). 3200 RELAY: 1. Salem (Trey Double, Jacob McLachlan, Cameron Christopher, Hunter Christopher) 8:37.15; 2. Massillon Perry 8:46.80; 3. Fitch 9:48.26; 4. Girard 8:52.39; 5. Chaney 8:55.07; 6. Coventry 8:59.73; 7. Howland 9:11.72; 8. Canfield 9:11.78. 110 HURDLES: 1. Zach Murray (Salem) 15.47; 2. Damian Jackson (Coventry) 15.47; 3. Luke Laubacher (Perry) 15.77; 4. Jacob Comer (South) 16.20; 5. Reggie Floyd (Fitch) 16.75; 6. Colton Basile (Howland) 16.77; 7. Malik Shaver (Coventry) 16.95; 8. Malcolm Lambert (Chaney) 17.16. 100 DASH: 1. Isiah Tarver (Fitch) 11.25; 2. Aiden Hall (Struthers) 11.45; 3. Dylan Huff (Crestview) 11.56; 4. William Hines (Howland) 11.56; 5. Josh Lehwald (Salem) 11.74; 6. Daniel Bender (East Palestine) 11.91; 7. Anthony Coulton (Chaney) 12.04; 8. Delshawn Petroskhy (Chaney) 12.16. 800 RELAY: 1. Crestview (Dylan Huff, Ethan Powell, Brandon Yanssens, Jayce Meredith) 1:32.45; 2. Fitch 1:33.91; 3. Salem 1:35.74; 4. Chaney 1:36.43; 5. Struthers 1:36.56; 6. Coventry 1:37.02; 7. Canton South 1:37.23; 8. Massillon Perry 1:37.71. 1600 RUN: 1. Hunter Christopher (Salem) 4:27.86; 2. Lane Goble (Howland) 4:51.12; 3. Jacob McLachlan (Salem) 4:54.33; 4. Ben Bullocks (Coventry) 4:58.33; 5. Kevin Echelberry (Perry) 4:58.44; 6. Vinny Macciomei (Struthers) 5:01.53; 7. Louis Larney (Girard) 5:01.81; 8. Jonathon Simmons (Chaney) 5:02.25. 400 RELAY: Salem (Niko Walter, Andre Tonkinson, Zach Murray, Josh Lehwald) 45.13; 2. Struthers 45.24; 3. Canton South 45.62; 4. Girard 46.12; 5. Massillon Perry 46.91; 6. Coventry 47.26; 7. Howland 47.26; 8. Canfield 47.45. 400 DASH: 1. Marquan Herron (Chaney) 51.97; 2. Jayce Meredith (Crestview) 52.55; 3. Brandon Williams (Perry) 53.88; 4. Aaron Weiser (Fitch) 54.05; 5. Seth Ameduri (Salem) 54.42; 6. Marquise Herron (Chaney) 55.37; 7. Johnathan Cress (Leetonia) 55.81; 8. Gavin Lambert (East Palestine) 55.90. 300 HURDLES: 1. Jacob Comer (South) 41.79; 2. Malik Shaver (Coventry) 41.84; 3. William Hardenbrook (Crestview) 43.41; 4. Zach Murray (Salem) 43.76; 5. Malcolm Lambert (Chaney) 44.13; 6. Josh Welch (East Palestine) 44.53; 7. Andre Tonkinson (Salem) 44.59; 8. Reggie Floyd (Fitch) 45.27. 800 RUN: 1. Vincent Mauri (Howland) 1:57.79 (meet record); 2. Trey Double (Salem) 1:58.25; 3. Giovanni Copploe (Canfield) 2:05.28; 4. Sam Maguire (Fitch) 2:09.09; 5. Cameron Christopher (Salem) 2:09.37; 6. Derek Sletvold (Fitch) 2:11.03; 7. Everett Ewing (Perry) 2:12.23; 8. Christian Dixon (GIrard) 2:13.73. 200 DASH: 1. Ethan Powell (Crestview) 22.61; 2. Drew Bretsik (Fitch) 23.64; 3. Delshawn Petroskhy (Chaney) 23.81; 4. Jess Paumier (Salem) 24.08; 5. Dominick Cathers (East Palestine) 24.37; 6. Holden Fritz (South) 24.64. 3200 RUN: 1. Devin Halter (Perry) 10:17.36; 2. Jacob Cronk (Perry) 10:35.97; 3. Zachary Russo (Canfield) 11:03.84; 4. Cole Rutledge (East Palestine) 11:06.69; 5. Ben Anderson (Fitch) 11:09.01; 6. Dev Patel (Coventry) 11:11.53; 7. Owen Hartwig (Coventry) 11:19.00; 8. Lucas Zeigler (Salem) 11:20.93. 1600 RELAY: 1. Massillon Perry (John Backum, Cam Nickson, Izzy Moraels, Brandon Williams) 3:42.54; 2. Coventry 3:43.71; 3. Canfield 3:44.13; 4. Girard 3:51.94; 5. Fitch 3:54.73; 6. East Palestine 3:56.98. DISCUS: 1. Tommy Leskovac (Fitch) 146.8; 2. Cooper Stockman (Salem) 43-9; 3. Blake Kusky (Fitch) 141.9; 4. Kyle Jornigan (Fitch) 141-9; 5. Daryl Smith (Girard) 141-2; 6. Jacob Monigold (Salem) 136-7; 7. Vincent Hepola (Canfield) 134-5; 8. Andrew Morchak (Canfield) 132-7. SHOT PUT: 1. Dominic Perry (Crestview) 55-0 1/2; 2. Kyle Jornigan (Mooney) 50-6 1/2; 3. Garrett Hogan (Fitch) 44-10 1/4; 4. Daryl Smith (Girard) 43-10 1/2; 5. Christian Armstrong (Fitch) 43-9 1/2; 6. Kerri Hewlett (Mooney) 41- 5 1/2; 7. Jarod Tincher (Canfield) 41-1 1/4; 8. Richie Hofus (Canfield) 39-0. LONG JUMP: 1. Dylan (Crestview) 20-11 1/2; 2. Jimmie Painter (Coventry) 20-5 1/2; 3. Jojo Lapanja (Perry) 20-3 1/4; 4. Deondre McKeever (Fitch) 30-2; 5. Jarod Cannon (Salem) 19-4 1/2; 6. Seantaris Blackmon (South) 19-3 3/4; 7. Marquan Herron (Chaney) 19-3; 8. Tyler Evans (Fitch) 19-1 1/2. HIGH JUMP: 1. Stephen Darlington (East Palestine) 6-2; 2. Turner Johnson (Salem) 6-0; 3. Nate Leskovac (Fitch) 5-10; 4. Doendre McKeever (Fitch) 5-10; 5. Dominic Malito (Girard) 5-10; 6. 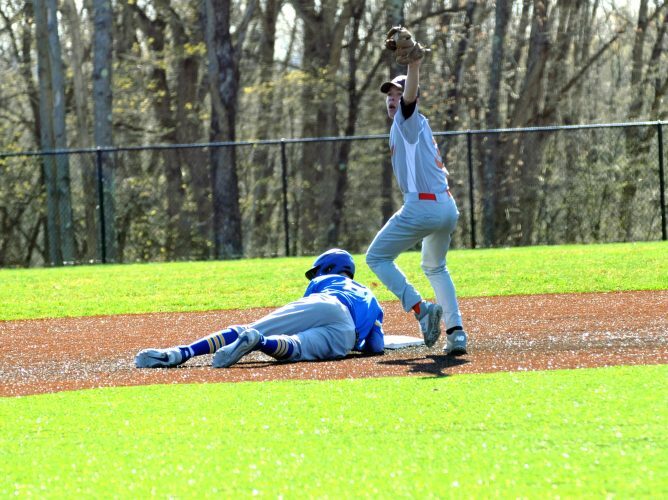 William Hardenbrook (Crestview) 5-8; 7. Terrance Davis (Girard) and Luke Laubacher (Perry) 5-8. TEAM STANDINGS: 1. Salem (138), 2. Austintown Fitch (124 1/2), 3. Howland (81), 4. Canfield (79 1/2), 5. Canton South (60 1/2), 6. Akron Conventry (53 1/2), 7. Girard and East Palestine (23), 9. Youngstown Mooney (15), 10. Struthers (14), 11. Youngstown Chaney (9). 3200 RELAY: 1. Salem (Halle Cochran, Abie Cochran, Alexis Miller, Carly Hall) 10:45.28; 2. Howland 11:15.98; 3. Fitch 11:20.25; 4. Canfield 12:03.92; 5. Girard 12:25.94; 6. Coventry 12:27.76; 7. Mooney 12:48.49; 8. East Palestine 12:51.89. 100 HURDLES: 1. Ashley Martinez (Coventry) 17.10; 2. McKenzie Cline (Fitch) 17.15; 3. Chenille Poe (South) 17.21; 4. Abbie Householder (Canfield) 17.59; 5. Juli Jones (East Palestine) 18:39; 6. Jami Jones (East Palestine) 18.49: 7. Alli Krohn (Fitch) 18.95; 8. Lauren Null (Howland) 19.34. 100 DASH: 1. Logan Franzowski (Fitch) 13.19; 2. Alena Williams (Fitch) 13.20; 3. Serena Sammarone (Canfield) 13.47; 4. Rachel Fogg (Coventry) 14.03; 5. Makayla Smith (South) 14.04; 6. Paige Bailey (Salem) 14.18; 7. Isabella Merlo (Howland) 14.19; 8. Ra’Niya Gibson (Cheny) 14.29. 800 RELAY: 1. Salem (Kelly Hutton, Lydia McKee, Paige Bailey, Haley Rozeski) 1:53.63; 2. Fitch 1:54.10; 3. Canton South 1:56.17; 4. Howland 1:56.85; 5. Coventry 1:57.56; 6. Canfield 1:58.31; 7. Girard 1:58.46; 8. Chaney 1:59.81. 1600 RUN: 1. Carly Hall (Salem) 5:27.65; 2. Kristin Yeager (Fitch) 5:36.00; 3. Julia Magliocca (Canfield) 5:36.46; 4. Molly Yasnowski (Howland) 5:43.18; 5. Elenie McNally (Howland) 5:54.99; 6. Clara Double (Salem) 6:07.44; 7. Ashley Fuller (Fitch) 6:07.96; 8. Faith Taylor (South) 6:10.42. 400 RELAY: 1. Fitch (McKenzie Chine, Alena Williams, Jenna Rodgers, Loan Franczkowski) 51.57; 2. Salem 54.15; 3. Canfield 54.87; 4. Howland 55.13; 5. Canton South 55.16; 6. Girard 55.71; 7. Coventry 55.78; 8. East Palestine 59.28. 400 DASH: 1. Ingram Adria (Fitch) 62.25; 2. Halle Cochran (Salem) 63.40; 3. Breanna Struble (East Palestine) 64.69; 4. Lydia McKee (Salem) 64.85; 5. Gia Diorio (Mooney) 65.36; 6. Kate Ross (Canfield) 65.78; 7. Cheyenne Comer (South) 66.79; 8. Kate Li (Howland) 67.20. 300 HURDLES: 1. Ashley Martinez (Coventry) 51.66; 2. Daria Williams (Fitch) 51.87; 3. Abbie Householder (Canfield) 53.14; 4. Maria Glaros (Howland) 54.89; 5. Maya Serrano (Girard) 55.47; 6. Anna Goodwin (Salem) 57.32; 7. Alli Krohn (Fitch) 57.37; 8. Annie Davidson (Salem) 57.68. 800 RUN: 1. Haley Rozeski (Salem) 2:22.97; 2. Jenna Craigo (Howland) 2:24.26; 3. Kristin Yeager (Fitch) 2:27.98; 4. Camryn Kohout (Canfield) 2:38.16; 5. Sarah Pitko (Fitch) 2:41.95; 6. Molly Hopple (Salem) 2:44.10; 7. Hope Figley (East Palestine) 2:45.63; 8. Faith Taylor (South) 2:48.03. 200 DASH: 1. Toni Denmark (South) 27.88; 2. Erica Merkel (Howland) 28.55; 3. Gia Dorio (Mooney) 28.55; 4. Jenna Rodgers (Fitch) 28.95; 5. Rhiea Gordon (Chaney) 29.10; 6. Kelly Hutton (Salem) 29.22; 7. Libby Vanderark (Coventry) 29.35; 8. Paige Bailey (Salem) 30.71. 3200 RUN: 1. Haley Rozeski (Salem) 12:01.25; 2. Ashley Ventimiglia (Canfield) 12:)4.39; 3. Maria Dellimuti (Howland) 12:21.48; 4. Molly Hopple (Salem) 12:46.75; 5. Gretchen George (Fitch) 12:57.91; 6. Gabrielle Reuschling (Howland) 13:15.89; 7. Trinity Niznik (Fitch) 13:21.98; 8. Steffie Marcinaiak (Canfield) 13:22.58. 1600 RELAY: 1. Salem (Halle Cochran, Haley Rozeski, Kelly Hutton, Carly Hall) 4:16.72; 2. Austintown Fitch 4:21.202; 3. Canfield 4:22.95; 4. Coventry 4:53.84; 5. Struthers 5:07.11; 6. Youngstown Chaney 5:27.55. DISCUS: 1. Caitlyn Marx (Salem) 137-3; 2. Brianna Dunlap (Canfield) 112-9; 3. Jana Stefanski (Struthers) 108-2; 4. Abbie Antram (Salem) 108-1; 5. Jaliyah Mixon (East Palestine) 105-4; 6. La Sage Johnson (South) 99-0; 7. Taylor Bailey (Fitch) 97-1; 8. JaNyaha McCaskill (Fitch) 96-9. SHOT PUT: 1. Abbie Antram (Salem) 36-6; 2. Megan Mitchell (South) 34-9 1/2; 3. Taylor Bailey (Fitch) 34-5 1/4; 4. Caltlyn Marx (Salem) 33-9; 5. Jana Stefanski (Struthers) 33-8 1/2; 6. Brianna DUnlap (Canfield) 33-0 1/2; 7. Jaliyah Mixon (East Palestine) 33-0; 8. Jamine Yates (Coventry) 31-0 1/2. LONG JUMP: 1. Jalya Brown (Girard) 16-3; 2. Na’Veyah Parisi (Howland) 15-6 1/2; 3. Rachel Fogg (Coventry) 15-2; 4. Serena Sammarone (Canfield) 15-0 3/4; 5. Erica Merkel (Howland) 14-11 1/4; 6.Gia Dorio (Mooney) 14-5 3/4; 7. Shania Stiers-Royal (FItch) 14-5 3/4; 8. Ryley Chambers (Canfield) 14-4. HIGH JUMP: 1. Toni Denmark (South) 5-2; 2. Madison Sisler (Howland) 4-10; 3. Abigail Nicols (South) and Morgan Ross (Coventry) 4-8; 5. Shania Stiers-Royal (Fitch), Lydia McKee (Salem), Ryley Chambers (Canfield) and Echo Mayer-Kutz (Salem) 4-8.